Throngs of people were overwhelmed by tears and cheers on December 12 as French Foreign Minister Laurent Fabius, president of the Paris climate change conference, struck a green gavel. It signaled the conclusion of a marathon 13-day negotiation between delegates representing nearly 200 different countries and regions, who had gathered in Paris. 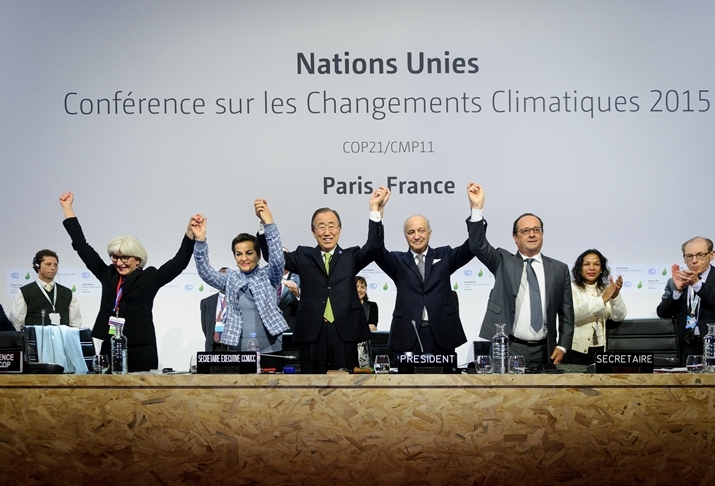 The representatives at the 2015 United Nations climate change conference made a deal that will go down in history as a rare moment of worldwide cooperation in the face of a monumental challenge. But as fellow negotiators hugged each other in celebration, grave concerns lurked in the corners of their minds--this was just the beginning of a war against climate change that is expected to last for generations. The unprecedented victory was a result of the 195 nations that acted in unison to commit to carrying out a legally binding climate deal. They carried the hopes of people around the world--the curbing of greenhouse gas emissions to protect against the catastrophic consequences of a warming atmosphere. In the past 23 years since the United Nations Framework Convention on Climate Change (UNFCCC) came into being, little progress had been made on this front, even if you count the Kyoto Protocol and Bali Roadmap as being effective. Especially considering the failed 2009 Copenhagen conference, at which countries railed against each other with bitter animosity and developed countries refused to hold up their previously agreed-upon obligations. The world has come a long way from the days when it seemed like countries would not be able to settle their near-sighted disputes, as reflected by the tone and language of the leaders involved in the accord. "We have entered a new era of global cooperation on one of the most complex issues ever to confront humanity. For the first time, every country in the world has pledged to curb emissions, strengthen resilience and join in common cause to take common climate action," said UN Secretary General Ban Ki-moon, who acclaimed the Paris agreement as a resounding success for multilateralism. "At the Paris climate change conference, we adopted an equitable and reasonable, comprehensive and balanced, ambitious, durable and effective, and legally binding agreement," claimed Xie Zhenhua proudly, as China's special representative on climate change affairs. He continued that the deal will send the world a "strong, robust and positive [message] to achieve green, low-carbon, climate-resilient and sustainable development." Xie's view was echoed by Nicolas Stern, Chair of the London-based Grantham Research Institute on Climate Change and the Environment, who took the conclusion of the climate change conference as a historical moment and believed that the Paris agreement will create enormous opportunities as countries begin to accelerate along the path toward low-carbon economic growth. Lo Sze Ping, CEO of World Wildlife Fund China, noted that China was playing a very constructive and critical role in pushing forward the conclusion of the Paris deal. "Many key solutions such as proposals bridging consent for the final text are actually a result of China's joint cooperation with many of the other key negotiation parties," said Lo. China is taking the initiative on issues such as climate change by reaching out to different countries. "This time, China appeared with more confidence and openness in dealing with climate issues, and has taken up an increasingly important role of coordinating developed and developing countries and promoting mutual trust and consensus among different groups," said Yang Fuqiang, a senior adviser on climate, energy and environment for the Natural Resources Defense Council's China Program. Although the "wheel of climate action turns slowly," said Kumi Naidoo, Executive Director of Greenpeace International, "it has turned in Paris." Stretching that metaphor, one hopes that the wheel will continue to turn forward, not backward. Echoing similar thoughts, Zou Ji, Deputy Director General of the National Center for Climate Change Strategy and International Cooperation, has suggested that the bottom-up-oriented Intended Nationally Determined Contribution (INDC) system has contributed greatly to the success of the Paris conference. "As the second legally binding document under the UNFCCC, the Paris agreement varies from the Kyoto Protocol which adopted a top-down forcible emission reduction mechanism and couldn't win approval from some developed countries," said Zou, noting that the United States' refusal to sign the Kyoto Protocol, Canada's withdrawal and Japan's reluctance to join the second commitment period are testimony to the failure of the top-down method. By implementing the Paris agreement, China will take up the opportunity to reduce pollution and extreme weather events, promote industrial development and create more jobs. More importantly, the agreement has sent a policy signal which will exert more influence on investors and consumers and propel China's green and low-carbon transformation, according to Zou. Wu Daohong, President of Beijing Shenwu Environment and Energy Technology Corp., said that the market potential for energy conservation and emission reduction is huge. 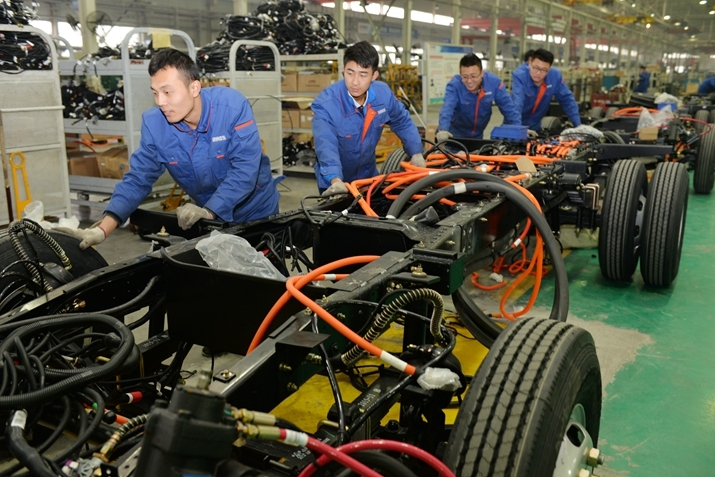 "When enterprises have found a way to enhance efficiency, they tend to use advanced technologies to lower costs by saving more energy," said Wu. "We have [achieved] solid results on all key points," said Ban, who noted that the agreement is ambitious, flexible, credible and durable. 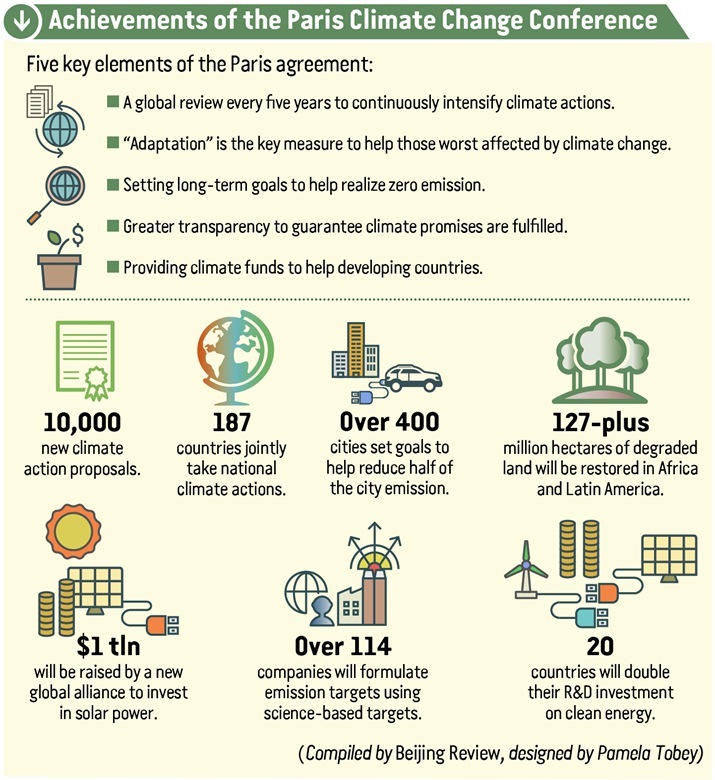 The Paris agreement is comprised of 29 items, encompassing targets in finance and technology, capacity building, transparency, mitigation and adaptation, loss and damage, global stocktaking and so on, and is expected to be signed into action in April 2016. If just 55 countries which produce at least 55 percent of the world's total greenhouse gas emissions ratify the agreement, it will enter into force. That is to say, the threshold for the agreement to take effect has been lowered from that of the UNFCCC and Kyoto Protocol. "The agreement will come into force if 55 countries agree to sign it, implying a stronger will to perform real deeds," said Li Junfeng, Director General of the National Center for Climate Change Strategy and International Cooperation. The agreement requires countries to work together to limit the increase of the global average temperature to well below 2-degree-Celsius above pre-industrial levels and to pursue efforts to limit the increase to just 1.5 degrees Celsius. To this end, countries agreed to cut emissions drastically to realize net-zero greenhouse gas emissions by the second half of the century. Taking into consideration the conditions faced by some small island countries, the concept of a 1.5-degree-Celsius limit was included into the agreement, indicating a willingness to ramp up efforts to tackle climate change, said Li. "Countries will need to have net-zero greenhouse gas emissions sometime in the second half of the century. For the 2 degrees Celsius goal, that's net-zero between 2080 and 2090, and between 2060 and 2070 for 1.5 degrees Celsius, said Jennifer Morgan, Global Climate Director of the World Resources Institute. However, all of the INDCs currently submitted by countries would result in an average global temperature increase of around 2.7 degrees Celsius by 2100, falling short of the 2-degree-Celsius goal, according to a report released by the International Energy Agency. To bridge the gap, countries have agreed to assess their implementation strategies and take stock of their efforts' results every five years, encompassing mitigation and adaptation, financial support and so on. The assessments will start from 2023. After that, countries will have to reinforce their actions every five years. Beyond that, the agreement also urges developed countries to scale up their level of financial support. It suggests the creation of a concrete roadmap to achieve the goal of jointly providing $100 billion annually in funding by 2020 for mitigation, adaptation and new technological support development. "Without formulating a pragmatic roadmap, pledges of financial support made by developed countries will become a pie in the sky. Future negotiations will be based on the roadmap," said Kevin Watkins, Executive Director of the Overseas Development Institute. "More financial support is needed to ensure poor countries are not left paying the price of a climate crisis that was not of their making," Watkins added. In terms of a historical responsibility, it makes sense that "developed countries should fulfill their promises to assist developing countries in terms of finance, technology and capacity building, laying a solid foundation of mutual trust for future negotiations," said Xie. "China had achieved a lot, bilaterally, before the conference was convened, such as making joint announcements with the United States, France and India. Domestically, it proactively promotes ecological awareness, and sets a good example for other countries to follow," said Zou. He stressed that China has been striving to safeguard the interests of developing countries by sticking to the principles of equality, common but differentiated responsibilities and each country's respective capabilities. Yet even the deal was sealed off, new challenges reared their heads. The Paris agreement and the supporting decisions are an unparalleled diplomatic triumph. Yet it is crucial to distinguish between diplomacy and implementation, said Jeffrey Sachs, Director of the Earth Institute of Columbia University, pointing out that the urgent, long overdue challenge of implementation is not a job for diplomats but for business leaders, engineers, financial managers and politicians. As far as China is concerned, the agreement must now be integrated into the nation's 13th Five-Year Plan (2016-20) and be transformed into domestic strategies and schemes. Ongoing efforts need to be made to honor the agreement in terms of policies, mechanisms, technologies and finance. Also, the nation should work with the international community to hammer out the details in promoting transparency and assessment, intensify the research and development of low-carbon technologies, further restructure the economic system and develop some new standards, according to Zou. "This is not a moment for triumph, given the lives that have been lost already as a result of climate impacts and the lives that are on the precipice as temperatures rise. This is a time for urgent action," said Naidoo. The effects of climate change are starting to be seen, felt and heard by people around the world. People in Pacific Ocean islands have already started fleeing to other countries as a result of debilitating floods; the U.S. State of California has been confronted by droughts that shrivel up crops and dries up water reserves; and Beijing recently succumbed to red-alert levels of smog that have forced young children to stay indoors. The Paris agreement may be a step in the right direction, but was just one battle in a long war with a distant end in sight. For the sake of our future generations, citizens of the world must work both individually and together to protect our environment and mitigate the risks of climate change.